WARNING: This niche is HOT... and the time is NOW! 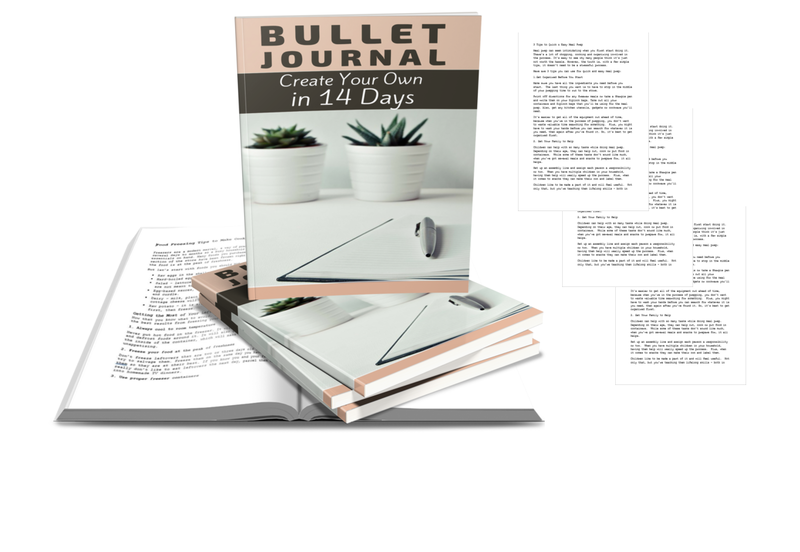 "Discover How You Can Tap Into the Super PROFITABLE Bullet Journaling Trend and Quickly Profit from it While It's Hot!" DFY Challenge To Create a Product That Engages Your Audience, Builds Authority and Provides Value to Desperate Readers!! Tap Into a Highly Profitable Niche! Over 25 Royalty Free Images To Make Your Product Look Awesome! Engaging Challenge Days to Build Trust & Loyalty With Subscribers. Headlines Swipes to use in your marketing efforts. Grab Your Done-For-You 14 Day Challenge Content For Only $47! You'll get all of this content and graphics for only $47! Plus anyone who buys this amazing deal will also get an opportunity to pick up 3 more journal related bundles to help you load up your blog with content, create products for your customers or anything else you'd like to do with it. It allows people to journal from the heart, have a creative outlet, create a to-do list, make a grocery list, know what their most important actions are for the week AND so much more. But one appeal is that it allows all of this to be in one place. You don’t have to have a whole slew of planners for different things. This can be cumbersome and just plain heavy if you’re carrying all those planners around. Each bullet journal is personalized to the person creating it. So, THEY get to decide what is important to them. The only problem is that there is so much to know about Bullet Journaling when you first start. It might be an amazing resource, but if you don’t know what you’re doing – you’re never going to use it. They’ll need a strategic plan that works. That’s where the Bullet Journaling Challenge comes in! 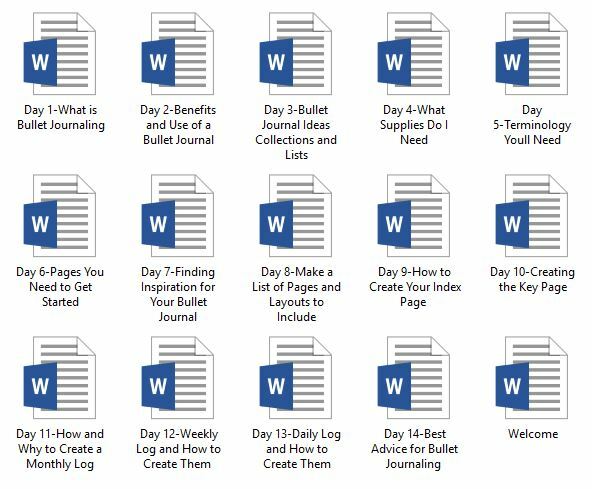 With this 14-day challenge you can teach your audience exactly how to use the journal effectively. From page layouts to tools they need to use. All the important things they’ll need to know are there. Let's take a look at what you're getting! This brand-new program will help your participants with a strategic, easy-to-follow, challenge that is guaranteed to help your customers / audience get started with Bullet Journaling. 14-Day Challenge: Ready to use challenge that includes a Welcome email, as well as 14 Challenge Days. Schedule these on your blog and offer a free challenge to your readers and subscribers OR use it as a product to sell to people who want to learn how to bullet journal effectively. 14-Day Intro Emails: Every single day comes with an intro email. This email is specifically written to help you guide your readers to the appropriate blog post or challenge day at the right time. You can set these up in your email software as a sequence or on a Facebook group as a post. 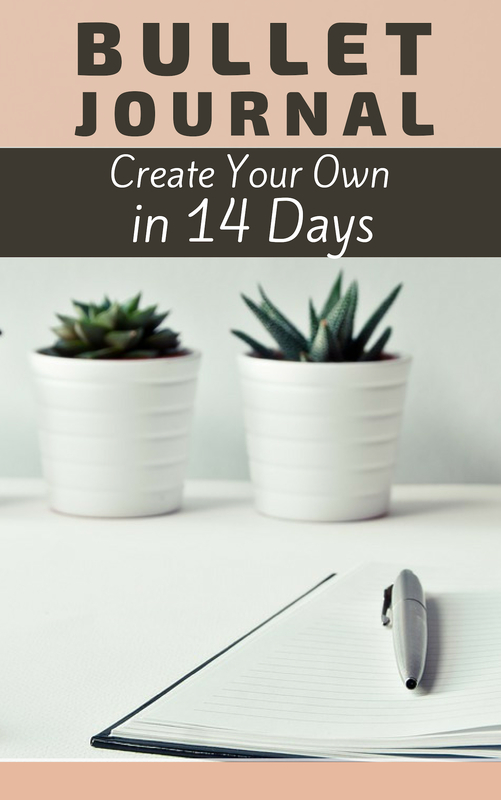 35-Page eBook, “Bullet Journal: Create Your Own in 14 Days (Challenge Days Combined): You might not want to use this as a challenge, so I’ve compiled the challenge days into an eBook. The wording is changed a little so that it an eBook and not a challenge. Not only that, but this eBook has been formatted with headings and images for your convenience. 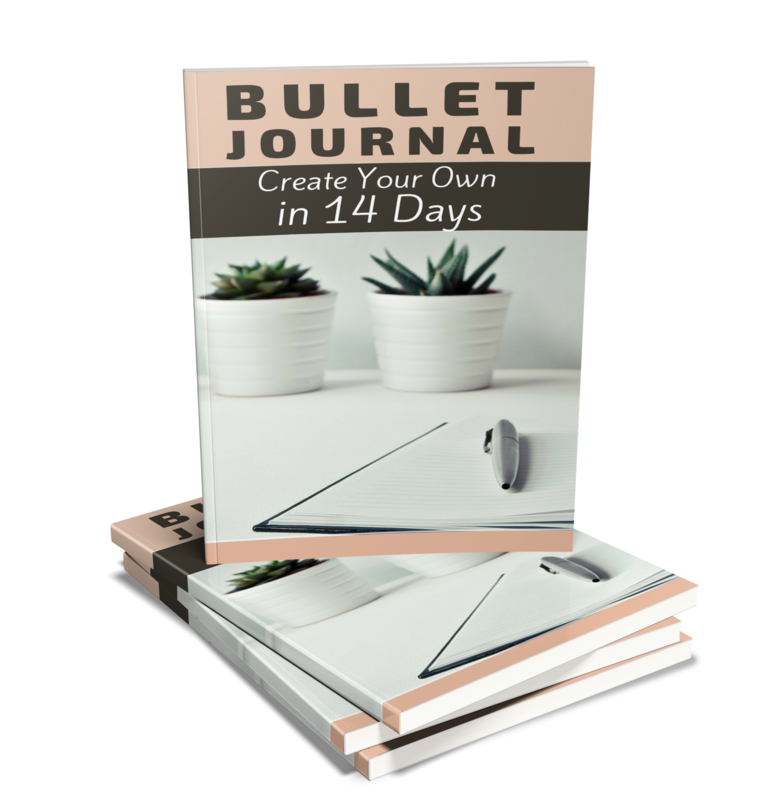 Canva eCover Template: You’ll be provided with an eBook cover Template in Canva for the “Bullet Journal: Create Your Own in 14Days”. This will allow you to quickly and easily add your branding and change things on the eCover. Promotional Emails: You’ll get emails that are going to help you promote your new product to your current audience, as well as people who opt-in to your list. Canva eCover Template: You’ll be provided with an eBook cover Template in Canva for the “25 Incredibly Useful Bullet Journal Hacks”. This will allow you to quickly and easily add your branding and change things on the eCover. 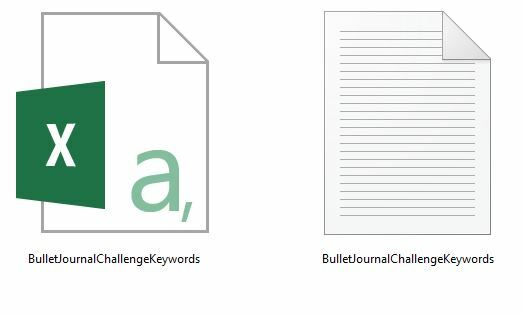 100 Long Tail Keywords: You’ll get researched keywords that are for bullet journaling, bullet journal and words similar that will help you to get SEO ranking. 114 Headline Swipes: This includes 114 Headlines and templates that you can use for taglines, subheadings, subject lines, reports and eBooks. You’ll be able to use these in your marketing efforts when you build your sales page, download page, social media posts and so much more. It is much easier to use a template instead of coming up with someone on your own. Tweak these and then use them to fit your purposes. People love to participate in challenges. It is a way to get something you want to do accomplished. That is because each day you’ll be sending them a blog post that helps them take action. You’re going to break up Bullet Journaling in small tasks. This helps people get out of the overwhelm and start. Each day you continue to encourage and motivate them. In this module you’re going to get the 14 day challenge, as well as an intro blog post that sends them an overview of what they’ll be working on each day. Why would you want to run a challenge on your blog? Engage Your Audience – Every day you’ll be sending people an action task or something they’ll need to learn. Have them post or comment when they’ve completed their task. Create a Community Of Like Minded Individuals – By creating a place for people to come together you’re going to be creating a community that is going to motive and engage each other during the challenge…and after! You can hold one on Facebook in a group, on your blog or even a forum. Stands Out & Grabs Attention – People are drawn to challenges, so when a reader first lands on your site they’re going to notice a challenge. Take Action – Because knowing what to focus on is the key to success and you’re going to be sending them tasks every day to help them. This is going to motivate them to take action. Once they accomplish the goal of the challenge they will think highly of you because you’re the one who helped them accomplish it! Drive Traffic To Your Site – You can turn followers into subscribers by promoting your challenges on social media challenges. Challenges can increase the amount of traffic that you get on your site. Build Your Email List – Because people want to participant in the challenge you’ll be building your email subscriber list. Increase Your Sales – By bringing more visitors to your site this is going to give you more sales. People will see you as an expert and will trust your site more = more sales. Set this up as a challenge that everyone works through together. This will create a sense of community and your participants will be engaged during the entire challenge. 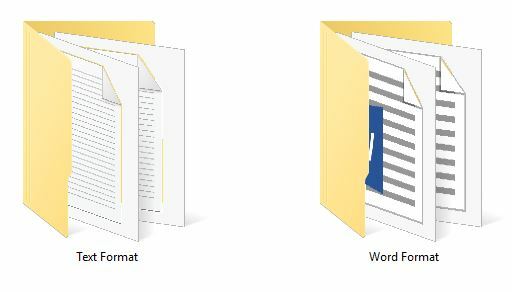 You'll get the challenge days in Word and Text format. You’ve got the challenge – now what? Well the next part is to set up and use the intro emails. These done-for-you emails were made for you to introduce each day of the challenge to your list. They are formatted for email, but you can repurpose them for social media posts. You could even use them both ways! These are going to save you time during your challenge. You can set up a sequence in your favorite email software program or schedule them for certain days in your Facebook group. Tweak and post them. It’s that easy! Not sure you want to hold a challenge? You’d rather get a product on your site to sell? You can do that as well. In this section the eBook has been compiled, formatted and edited to reflect the different format. This means you can easily add your voice in the eBook and get it up on your site in a matter of hours. Another option would be to use the eBook as a bonus to your challenge so that people have a printed version of the challenge and can follow along or you can send it to them after they’ve completed the challenge for their convenience. Why Use the Challenge As An eBook? Create a hot-selling eBook - There’s a special kind of credibility about having your own eBook. Learn how to build your brand using this method. Speak directly to your ideal readers wants and needs – Get this right, and you’ll be well on your way to the best-seller’s list. Critical branding elements that can’t be ignored – Your book is the face of your business. Make sure that you have one. Don’t keep putting it off! By doing those two steps you're new eBook will look completely different than any other DFY challenge that was bought. In this section I’ve provided with you a report that can be tweaked to fit your brand and used. The great thing about this report is the fact it can be used in so many different ways. Build your list with an opt-in report – One way to use this report would be as an opt-in for your site. 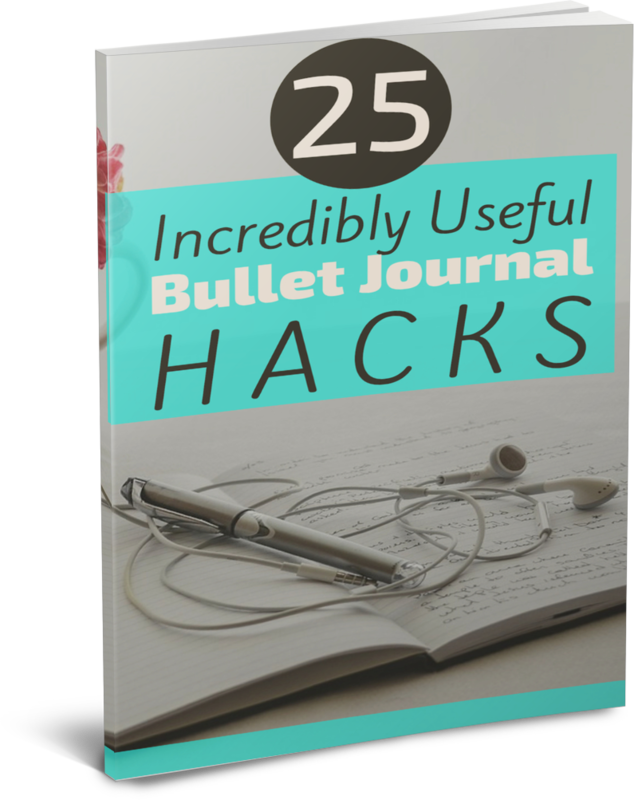 It goes over 25 different tips that will help people use their bullet journals. 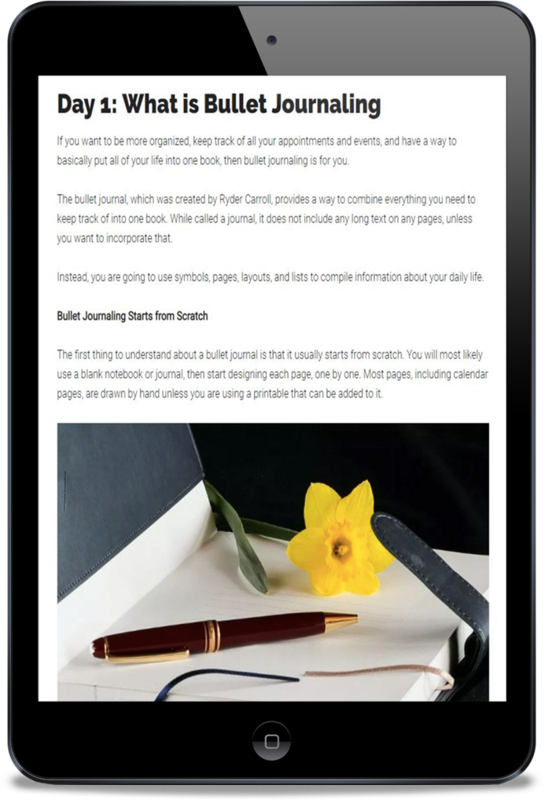 But the best part about this opt-in is that you could introduce and suggest a way for the reader to learn about and create their own bullet journal with your challenge! Add value to your challenge by including it in their program – Include the report in their challenge as a bonus. This will give them ideas and tips they can use during the challenge. 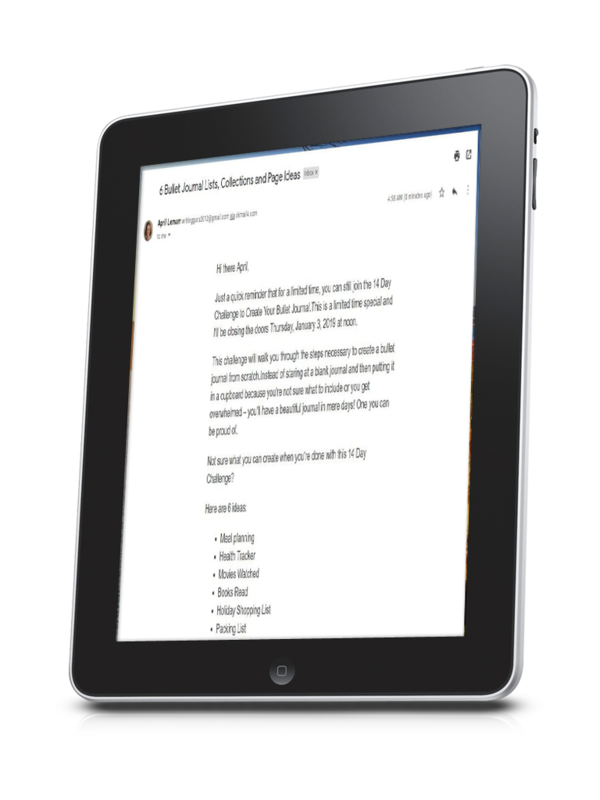 You'll get the report in Word and Text format. This report cover was also created in Canva and with it you'll get a fully customizable eCover template. This will make creating your own eCover so much easier because you just have to go inside the online software, change the colors to reflect your brand and give it a different title. You’ve set up your opt-in, but now what? You’re going to need to let your readers now about this wonderful challenge that you’re hosting so take these promotional challenges and set them up in a sequence. Anyone who signs up for the opt-in will start getting these emails that tell them all about the challenge. You can set them up once a day until they are done or if you’ve given yourself enough time you can send them once a week. Another great use for these promotional emails is to your list. People who are on your list are going to be interested in what you’re doing, so make sure to start letting them know about it as soon as you can. 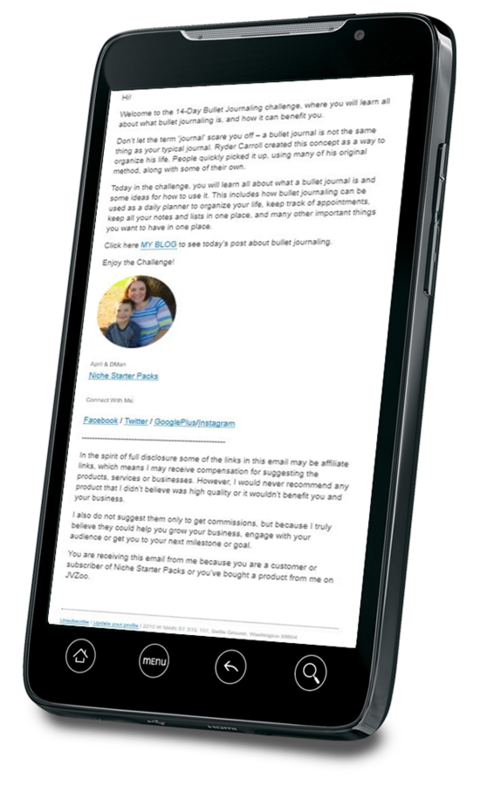 Then when the challenge is all set up – you can start sending them this series of promotional emails that are going to help you turn your readers into participants and buyers. You can use these as is or change them to fit your product. These emails will need you to go in there and put the relevant information - like date / time it will be available, plus you'll also be able to add the link to your join page. You'll get these emails in Word and Text Format. I’m sure you’ve heard that search engine optimizing is important for your site. Maybe you focus on it quite a bit or maybe not at all because you’re not sure what you need to focus on. You’ll get 100 long tail keywords. You might be wondering what long tail means and why you’ll need these instead of more broad keywords. Long tail keywords are keywords or phrases that are more specific and easier to rank…and get the attention of search engines. Not only that, but they convert well. They’ll help you build a site using different variations of words and become more specific with each blog post. Plus people who are searching for specific keywords will be more interested in your blog post than by using a general search term on the same topic. You'll get the keywords in both an Excel sheet and a text document. ​Everyone should have swipe files in their arsenal and with this you’ll be get a great start on yours. You’ll get 114 Headlines on Bullet Journaling. You can use for taglines, subheadings and subject lines, as well as report and eBook titles. Use them as is or tweak to fit your need. They can be a finished headline or a starting point. That is the great thing about swipes! You’ll be able to use these in your marketing efforts when you build your sales page, download page, social media posts and so much more. It is much easier to use a template instead of coming up with someone on your own. Tweak these and then use them to fit your purposes. 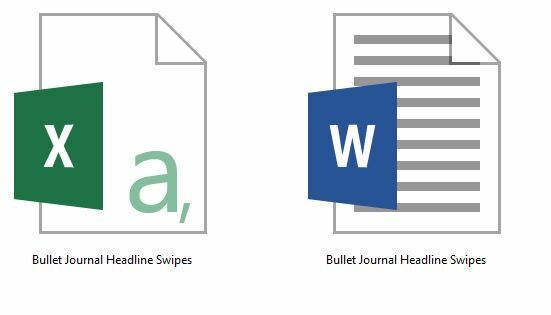 You'll get the Headline swipes in both an Excel Sheet and a Word Document. We all know just how costly images from stock sites can be. Well, you won't have to pay a cent for these 37 beautiful royalty free images taken from the creative commons. You can use these any way you wish to promote your site/products. You're limited by your own imagination. Grab It All For Only$47! If you want to grow your business then you have to start working smarter, not harder. Quit trying to cram more hours into the day, and more work into your hours, and make your time work for you. Create challenges that sell themselves, ones that can become your core product or add assets, once you’ve completed the challenge once you can start having participants work through on their own OR host it annually, this is all going to bring in more customers. By creating a challenge you’ll have a product that keeps working for you year after year. This challenge is the path. It’s time to put that content to work and turn it into an ongoing income stream - without having to create all the content to get it done! Your time is valuable, so by using this done-for-you challenge you won’t be wasting your energy coming up with a product your audience will love. Stop spending all your time and energy doing the tedious research and writing, and start bringing in a continuous income stream. Let me help! Make your time and energy work for you by concentrating on what you love! This DFY Challenge will save you time. Now you won't have to worry about researching, writing and editing! Ghostwriter's and graphic designers can be spendy if you have to outsource the entire pack. Buy for a fraction of the cost! Creating a product can be intimidating to some people and with this DFY challenge I've done all the hard work for you. You'll be able to use this content immediately. No waiting for outsourcers to get back to you. Simple upload to your blog. My job is to be up to date on the best topics in the market. Now you can relax about what to write about and what people want to read. Gain loyal readers and help your audience take action on something they've been meaning to do! You'll make a positive impression. P.S. 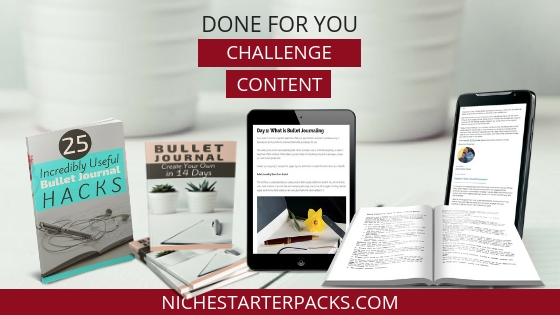 With this pack you'll get a done-for you challenge that you can sell in for a HOT topic…bullet journaling. People LOVE bullet journaling. Use this highly targeted done-for-you content to get more subscribers to your list and then turn subscribers to buyers..
P.P.S. Remember that people LOVE challenges because it helps them take action and get results. They’ll associate their accomplishment with you because your product helped them do it! ​​​​​1. Don’t pass on PLR rights to anyone, so your customer’s only get personal use rights. Want to become an affiliate? Take a look at the JVPage to grab your Affiliate links.